Basildon’s Council’s hired spin doctor - on loan from the nastiest of nasty councils, Tory Westminster - complains about the “emotive” tactics of Dale Farm Travellers. In an interview with PR Week, Basildon council’s head of communications, Cormac Smith, has today claimed there is a “huge amount of misinformation” in the media about the council’s bid to evict the 88 Irish Traveller families from the illegal Dale Farm site in Essex. There is no mystery to this. Around 100 of the 400 or so travellers living on-site are children. Could that be why they figure prominently in the coverage? The fact that there are so many women, children and elderly people living at Dale Farm is why the local Catholic Bishop, Thomas McMahon, describes the forthcoming eviction as a “humanitarian” issue. Mr Smith complains that a leader column in Monday’s Guardian which referred to the travellers’ imminent eviction as ‘ethnic cleansing’ was “extremely unhelpful”. In contrast, the council’s strategy is to emphasise “legality” and “equality” and that it is being “fair and decent”. However, it surely stretches the definition of decency to snapping point to throw 100 children onto the streets, having made no contingency for their education or welfare. The council remains infamous for its illegal gerrymandering under disgraced former leader, Dame Shirley Porter, in the 1980s – when poorer council residents were shipped out of flats in marginal wards in order to sell their homes to more affluent (Tory) voters. Leopards do not change their spots. Earlier this year it was revealed Westminster had threatened to introduce a byelaw banning charity soup runs for homeless people, claiming they caused litter and nuisance. After widespread opposition, the council was forced into a humiliating u-turn. Is this now the standard of PR expertise being sold to Basildon? Rather than spend money on an expensive spin operation to justify what is beginning to look like a dogmatic plan to forcibly evict the Dale Farm travellers at all costs, Conservative-controlled Basildon council would be better off seeking a way to avoid confrontation and support the moves of the local Catholic and Anglican bishops who are working together to find a less confrontational way of resolving the impasse. They will not only be left with an £8 million policing and clean-up bill but also a hefty invoice for PR services. Shades of things to come for Westminster residents caught up in the Housing Benefit caps? Their PR machine trying out what works and what doesn’t before they have to use it at home? This situation has been in negotiation for ten years without resolution – there has to come a point where the law is upheld. Or because travellers are a vulnerable group, should they be exempt from planning law? Why are they called “travellers” if they never move? Why do we all have to follow the rules and they dont? We didnt put these kids in that situation, their parents did by living the way they do. Surely its a hazard of their way of life. So for all those blathering on about the law – where do you suggest they go? Or would liquidation suit you more? Isn’t there a point where persecution ends and these stateless people are helped to live in mainstream society? Mike I suggest that they go somewhere it is legal for them to build a home. They ignored the planning laws, laws which as far as I know apply to everybody. Just because they are a minority does not give them the right to ignore the law, no more than it would give me the right, or would it be OK for me to build what I want where I want with no regard to local planning laws? They knew it was green belt land and they flouted planning law. However, councils have a duty to provide for travellers and gypsies. If they have failed to do so then there should be legal recourse, but taking the piss and abusing planning law isn’t the way ahead. It only increases resentment against gypsies and travelllers for a start. It may be inconvenient for the likes of Vanessa Redgrave and Kevin Meagher, but we do have a legal system and planning laws. It is vital that they are upheld and that all men (and women and children, etc, (for the PC brigade)) are equal before the law. Certainly, the impression I have got from hearing the travellers’ complaints on the news is that they believe that laws should not apply to them in the same way. Absolute nonsense. It’s also a delicious irony that the same people will stridently assert their legal rights and demand that the law is upheld when it works in their favour. As soon as they fall foul of it, it’s a different situation entirely, of course. We must all keep ‘blathering’ on about the law, even if some people don’t like it. @5 – Irish Travellers, Pavee in their own language, are an ethnic group. Please do some research before you insert your foot into your mouth like that, thanks. @8 – 90% of planning request permissions by both Pavee and Roma are rejected. Many councils reject them on a blanket basis. Basildon council staff have been caught using racist terms about this eviction. Quite the opposite of what I was saying, actually. We certainly do need to pay attention to the facts. These travellers have been, and still are, breaking the law. Eviction is the legally prescribed consequence. No, not necessarily. There are a lot of potential consequences. The one which is prescribed in this situation regardless of the facts is only because they’re Pavee. Again, Basildon council employees routinely use racist terms. Thanks for defending them, though. The bottom line with this case – as with others – is that local councils are simply shirking their responsibilities when it comes to providing adequate pitches. There are an estimated 300,000 Gypsies and Irish Travellers in the country. 80% are said to live on legal plots (according to DCLG). That presumably leaves 60,000 uncatered for. Until that gap is bridged there will be many futher cases like Dale Hall. Yes, uphold planning law, but this is not a case of a millionaire pulling a fast one on a barn conversion. This is 100 children and their families who have promised to move off the site if there is somewhere else for them all to go. Rather than beligerence we should be seeing more compassion and imagination in coming to a better result. And just to echo Leon’s point above, Irish Travellers (in this case) are a seperate ethnic grouping, recognised now by successive governments and should have their needs catered for by statutory agencies. This clearly doesn’t happen nationally (not just to pick on Basildon/ Essex CC). Ethnic monitoring is notoriously patchy and is evidence of public bodies not obey ing the law either. viz race relations Act while at the same time telling the travellers that they must obey the law to the letter.Rabbi Janet Burden(whom the Lord reward)reminded us of dark days gone by when minorities were used as scapegoats. It’s amazing what crawls out the woodwork at the least opportunity. People seem to be terribly prejudiced against this community of Irish Travellers. I’d be interested to see statistics to indicate whether the police have more trouble from the Dale Farm travellers than they do from the mainstream residents of Basildon. Irish Travellers are a recognised ethnic group, with hundreds of years’ heritage, and were once popularly called ‘tinkers’. I wonder if the council would pursue similar action if the site was occupied by a community of Jewish people, or Asian families, for instance. There would be public outcry, I’m sure. As as Irishman I resent the emotive term, “racism” that is thrown around by the left. Travellers are Irish and have the same racial makeup as the rest of the Irish (almost indistinguishably from the English). The Left by imputing racial difference where none exists, are in the same boat as Adolf Hitler and Co. What next: calipers to measure Traveller skulls to show they are racially distinct from English ones? Talk about playing the race card! Why are you trying to invent a situation.When was the last time you saw Jews and Asians illegally occupying premises.The Jews owned all their properties in Germany in the 1930’s. there was never any denial of that, but Hitler didn’t like them. @20. These gypsies own their properties too. If the council had originally fulfilled it’s responsibility to the ppl of Dale Farm none of this would have happened. Where are these ppl supposed to go when councils refuse to provide ethnically suitable sites for them. I think the council should be hauled over the coals for causing this fiasco, it is blatent mismangement o their part. @John Lord. I am not a leftie, more right of centre politically. It was not politicians who classified the Irish Travellers as a recognised ethnic group under the Race Relations Act 1976, it was established by the judges in the cases CRE v. Dutton 1989 and O’Leary and others v. Punch Retail 2000. In any case, these people have not exactly committed the crime of the century, all they’ve done is infringe a planning regulation. That, in my opinion, does not justify sending a pack of paid thugs to evict them, with all the upset it will inflict upon their children and old people. It’s like taking a sledge hammer to crack a walnut. All they have to do is to offer them another site with planning permission for residential occupation and those occupying the part of the site without consent will leave voluntarily. At the moment they have nowhere to go and neither are they allowed to travel, i.e. stopping by the roadside. These travellers continually complain that Councils are not providing anywhere for them to live. My local council did not “provide” anywhere for me to live. I went to work and sold most of my belongings to get the deposit for my first house. 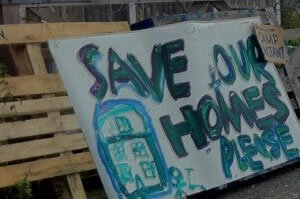 In the Dale Farm situation the council has offered them housing but they have refused it. Moving swiftly on (sorry about the pun)their constant complaints about planning being refused is nonsense. Buy suitable ground (not cheap greenbelt land) FOR A PROPER PRICE then you will find planning permission much more likely to be granted. And finally, when you camp somewhere leave it neat and tidy when you depart and your image may improve a little.